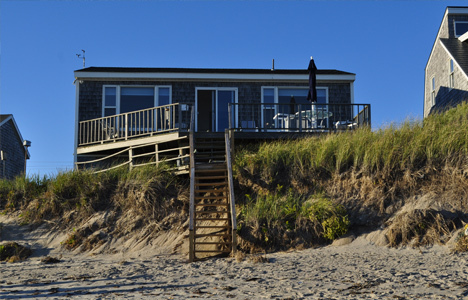 Several properties in the Jerusalem Beach area had been experiencing extensive erosion to the point where foundations of the homes were becoming exposed. Due to regulatory restrictions, rock and gabion installations were not allowed. 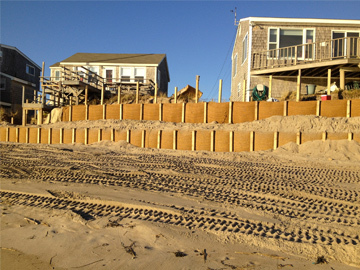 Thus, the homeowners evaluated a series of “soft” solutions to reduce both the rates of erosion and stabilize the coastal bank. 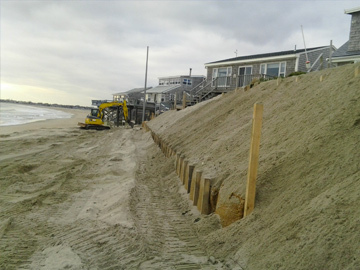 With the help of their permitting consultant, the bank stabilization method selected was to install a series of coir envelopes (both straight line and “scalloped”) including use of white oak toe anchor posts. 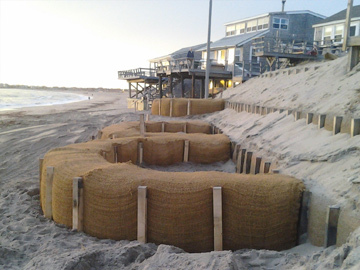 In addition, the installation involved sand nourishment to reestablish the slope of the coastal bank and provide coverage over the coir envelopes. NETCO completed the installation of the coir envelopes and stabilization system in four weeks, including the use of oscillating post driver. Close to 350 white oak posts (4″x 4″x 12′) were used as toe anchor posts.